Just one look at this photo, and I don’t have to tell you: Who needs the Holidays to enjoy this sumptuous looking delight!? Not me! What I love about this recipe: It calls for Arbol peppers and Garlic, two of the main ingredients in my luscious sauce! And how about that sourdough, though!? Enjoy this dish as part of your dinner this week! Chestnuts, mushrooms, garlic and shallots cooked in butter! Wow, how can that not make your mouth water!? Chestnuts and garlic you can get at the Atchison Farmers Market! Add cream and gruyere cheese and you got me! By the way 100 grams of chestnuts is about a quarter pound. Enjoy this delectable dish this week! Featured Specialty Crop – Chestnuts! The Chestnut is considered an ancient nut which was probably one of the first foods consumed by mankind. The Chestnut was spread throughout Europe by the Greeks and Romans. Most Chestnut trees found in North America are of the European variety, Castanea sativa. 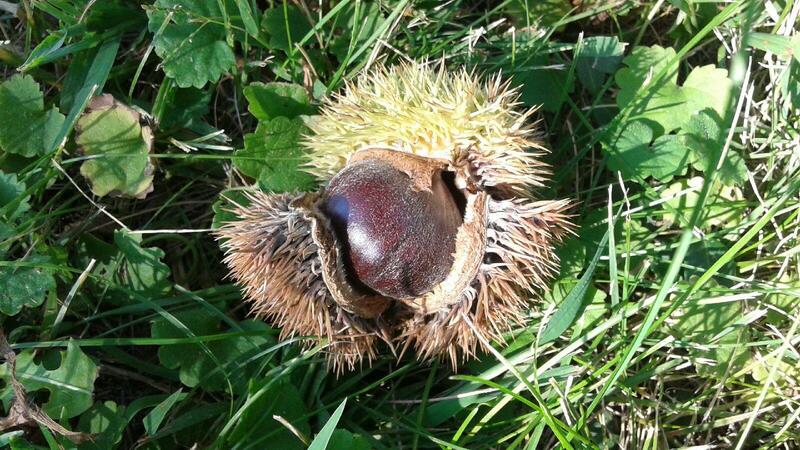 However, there were Chestnut trees that were native to North America, Castanea dentata, that were wiped out in the early 1900’s by a deadly Asian fungus. The only native Chestnut trees that survived were located on the west coast, in California and the Pacific Northwest. Why are Chestnuts So Good For You? Chestnuts are a delicious treat, either roasted or cooked in soups or other recipes, and have considerable nutritional value. The fiber content of chestnuts, 3 g per 100 g, is higher than that of walnuts, with 2.1 g per 100 g, pecans, 2.3 g per 100 g, and pistachios 1.9 g per 100 g but about half that of hazelnuts. Their fiber content makes them a low glycemic index food — one that raises blood sugar slowly. Chestnuts are high in vitamin C, minerals, such as potassium, copper and magnesium, amino acids and antioxidants. Chestnuts contain high levels of essential fatty acids, including linoleic acid, which are beneficial to cardiovascular health and proper neurological development in infants. The Chestnut has a creamy white flesh and crisp texture. The flavor of the Chestnut is sweet and somewhat starchy. These nuts have a round shape and are surrounded by a spiny case when harvested from the tree. Fresh Chestnuts have the consistency of potatoes when boiled or roasted. Chestnuts are dried into flour to make cakes, breads, muffins, soup thickener and polenta. Chestnuts can be candied, steamed, boiled, grilled or used in savory or sweet dishes. It could be tossed in soups or added to salads. The nuts are used to prepare chocolates, pastries, ice cream etc. Chinese use chestnuts as snacks. They are used in the desserts. Chinese chestnuts are added to the lamb and mutton dishes. Chestnuts are used on puddings. The nuts are used a vital ingredient in poultry stuffing. Chinese chestnuts are used to make the chestnut butter–cream. According to HDRA (Henry Doubleday Research Association of the UK), Organic farming works in harmony with nature rather than against it. This involves using techniques to achieve good crop yields without harming the natural environment or the people who live and work in it. The methods and materials that organic farmers use are summarised as follows. + Crops. Plants grown to be harvested as food, livestock feed, or fiber or used to add nutrients to the field. + Livestock. Animals that can be used for food or in the production of food, fiber, or feed. + Processed/multi-ingredient products. Items that have been handled and packaged (e.g., chopped carrots) or combined, processed, and packaged (e.g., bread or soup). + Wild crops. Plants from a growing site that is not cultivated. Bartlett pears are the most popular variety of European pear, known scientifically as Pyrus communis, in the world. Pears are members of the rose, or Rosaceae family. In the United States, Bartlett pears are the first variety to be harvested during the fall season. Bartlett pears are also known as the Williams, or Williams’ Bon Chrétien’ pear outside of the United States. They were discovered in England in 1765 and were introduced to the rest of England by a nurseryman named Williams. At the end of the 18th century Williams pear trees were imported to Massachusetts and planted on the Brewer estate. The estate was acquired by Enoch Bartlett, who later propagated and introduced the pear under his own name. Twenty-five years after it was introduced in the US, it was discovered that the Bartlett and the Williams were one in the same. Today, more than 95% of the pears sold in the United States are grown in Washington, Oregon or Northern California. Why are Pears So Good For You? Pears offer a good source of vitamin C, folate and dietary fiber. One medium-sized pear contains less than 100 calories. Most of the vitamin C in pears is in the skin, so pears should be eaten unpeeled. Providing some iron and potassium, pears contain pectin, a soluble fiber that helps control cholesterol levels. 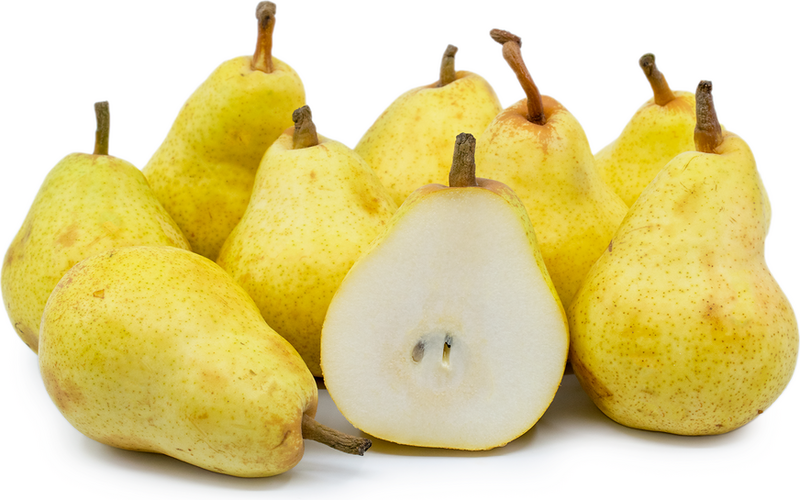 Bartlett pears are the only pears that have a “true” pear (or pyriform) shape and taste. The fruit’s color brightens as it ripens, which is a characteristic unique to Bartlett pears; most pears do not change color when ripe. At harvest they are a vibrant green, changing to yellow when ready to eat. When unripe, the texture can be gritty. The Bartlett pear has a distinct flavor and sweetness, its white flesh has a smooth, buttery texture. Bartlett pears can be eaten fresh, out-of-hand, or paired with cheese. They add a sweet flavor to salads and make excellent preserves, syrups, and chutneys. Bartlett pears are known as the “canning pear” because they have a distinct flavor and sweetness which preserves well. They make great additions to cakes, muffins, crisps and quick breads. Bartlett pears are also delicious dried or sautéed to compliment pork dishes. To ripen let sit at room temperature for a few days or in a paper bag to expedite the process, ripe Bartlett pears keep best in the refrigerator. Just look at how big and full of delicious flavor this dish is! Your Atchison Farmers sell yellow wax beans, garlic and dill! Enjoy this dish as a starter, simple snack or as part of your dinner this week! Do You Know: GMO Crops – Pros and Cons? Following is a short list of pros and cons of Genetically Modified crops. It is not exhaustive, so use it as an introduction to your own further research, if you like. 1. Insect Resistance – Some GMO foods have been modified to make them more resistant to insect pests. This can reduce the amount of pesticide chemicals used on the plants, thus potentially reducing exposure to pesticides. 2. 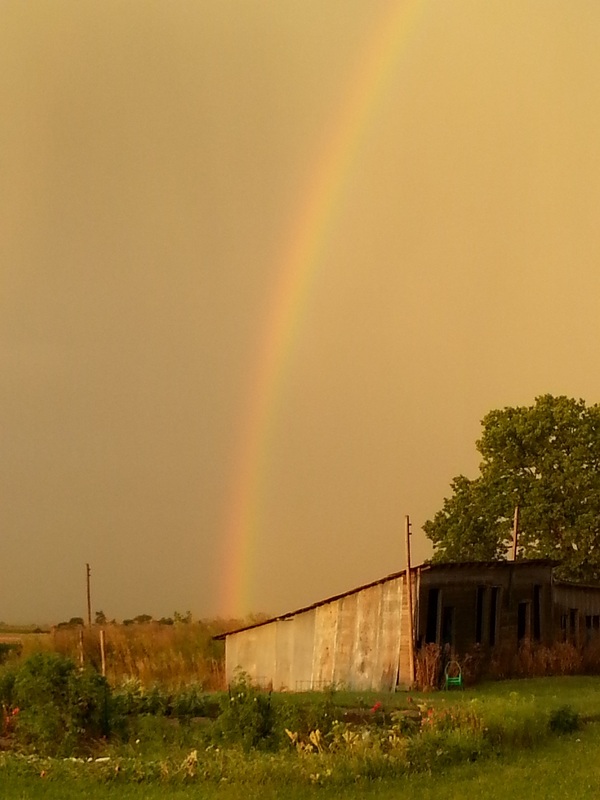 Environmental Protection – Oklahoma State University reports that the increase of GMO crops and animals often requires less chemicals, time and tools, and may help to reduce environmental pollution, greenhouse gas emissions and soil erosion. 3. More Nutritious (Improved) Foods – The Food and Agricultural Organization of the United Nations reports that some GMO foods have been engineered to be more nutritious in terms of mineral or vitamin content. Foods are also genetically engineered to give crops brighter colors, extended shelf-life and positive traits, such as seedless watermelons and grapes. 1. Allergic Reactions – GMO foods can present significant allergy risks to people, according to Brown University. Genetic modification often mixes or adds proteins that weren’t indigenous to the original plant or animal, causing new allergic reactions in the human body. In some cases, proteins from an organism that you’re allergic to may be added to an organism that you weren’t originally allergic to, prompting the same allergic reaction experienced from the first organism. 2. Decreased Antibiotic Efficacy – Some GMO foods have had antibiotic features built into them to make them immune or resistant to diseases or viruses, according to Iowa State University. When you eat them, these antibiotic markers persist in your body and can make actual antibiotic medications less effective. The university warns that such ingestion of GMO foods and regular exposure to antibiotics may be contributing to the decreased effectiveness of antibiotic drugs that is being noticed in hospitals around the world. 3. Gene Transfer – A constant risk of GMO foods is that the modified genes of the organisms may escape into the wild. 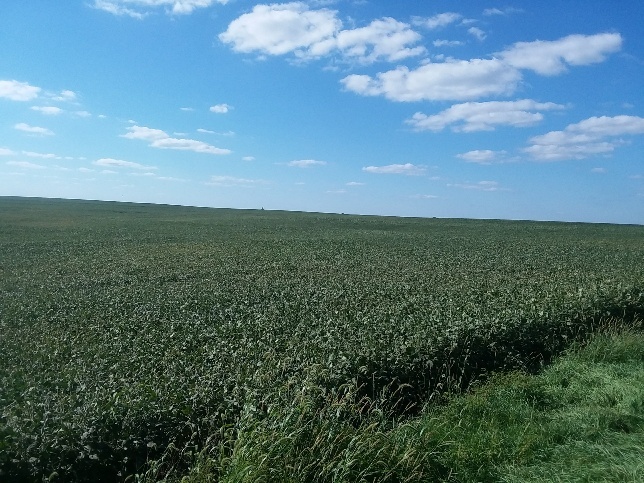 Brown University warns that herbicide-resistant genes from commercial crops may cross into the wild weed population, thus creating “superweeds” that are impossible to kill with herbicides. A related risk is that the escape of genetically enhanced animals and vegetation can create new super-organisms that can out-compete natural animal and plant populations to drive certain species into extinction.